"I would like to tell you about our new folk club. 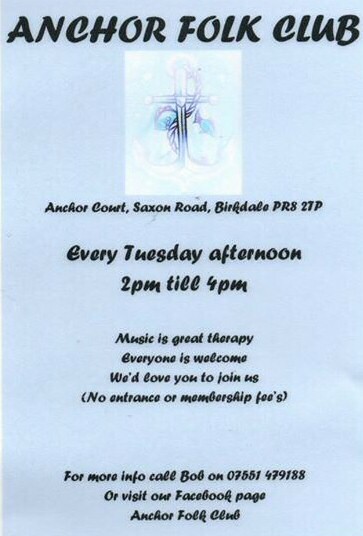 We meet on Tuesday afternoons, 2pm to 4pm, at Anchor Court, Saxon Road, Birkdale, Merseyside, PR8 2TP. We are retired, and hope to have other retirees come and join us. So, if you are looking for somewhere exciting to go, that's us. We are in a very comfortable lounge which has a piano tuned, to concert pitch. Unfortunately, we are not licensed, but feel free to bring your own. Or have a cup of tea or coffee with us. Any sort of music goes here, folk, pop, even classical. So whatever music or instrument you play, it's ok. Or just come along and listen to the music. We do have parking, but it is restricted to Blue Badge holders and residents, but there is ample street parking. The 15A, 47, 49 and X2 buses all pass our street, and Birkdale Station is just a short walk away. There are no admission or membership charges either. If you would like more information, contact me on 07551 479188 or visit our Facebook Page." Bob Evans. WORK commitments, busy family life and lack of motivation are just some of the reasons we don't stick with interests for longer. Further to this, 25% admitted they have tendency to splash out hundreds of pounds on hobbies such as cycling and playing musical instruments only to give them up them after a short period. In fact, 23% of people in the North West has given a hobby the heave ho having never used any of the items or accessories they purchased. Commissioned by the British Heart Foundation (BHF), which has a series of charity bike rides planned for 2019, the research also found we'll spend an average of ₤306.64 on cycling during our adult years. Emma Day, Cycling Manager at the British Heart Foundation, said:- "Modern life is incredibly busy and sadly fun things like our hobbies are 1 of the first things to be dropped when we're pushed for time. People took their hobbies up for a reason, whether to destress or socialise more, so it's important we make time to rekindle our passion for our hobbies or try new ones. Having a goal to work towards, like signing up to 1 of the British Heart Foundation's bike rides, is the perfect way to give people the motivation they need to keep up their hobbies. And, safe in the knowledge they're helping to raise money for the charity's life saving research at the same time whilst doing something they enjoy." The research also found 30% of North West residents have had up to 6 hobbies in their lifetime with 10% of residents admitting to giving up on a hobby within 6 months. In total, the UK dedicates 245 hours a year to our hobbies; that's more than 10 days over a 12 month period. Having some form of escape, to keep our mind sharp and to alleviate boredom are among the most common reasons for taking up a hobby. Further to this, 70% of adults agree it's 'really important' to have hobbies; and 1 of the most popular ones in the UK is cycling; with 36% of North West residents owning a bike. But 76% don't ride it anyway near as much as they would like to. In fact, the typical UK adult hasn't ridden a bike in almost 7 years. 20% of North West residents revealed they don't cycle more frequently because they believe they aren't fit enough; and 10% said they don't have a reason to cycle or goal to aim towards. Other obstacles to getting out on their bikes include being too busy and not having anyone to cycle with. Emma Day added:- "As the old adage goes, you never forget how to ride a bike. We're encouraging all those lapsed cyclists and people who said they'd like to ride more to dust off their bikes and sign up to the British Heart Foundation's Manchester to Blackpool Night Ride. By taking part you'll be helping to fund lifesaving research for the 7 million people in the UK living with heart and circulatory diseases." The BHF Manchester to Blackpool Night Ride happens overnight, on Saturday, 5 October 2019. You can sign up online now and also find out more about the BHF's charity bike rides on the BHF website. ► Football (watching and playing) = ₤427.14. ► Video gaming = ₤332.16. ► Playing an instrument = ₤261.09. ► Skiing / Snowboarding = ₤242.28. ► Rugby (watching and playing) = ₤175.04. SOUTHPORT is officially mad about pets, after colleagues in Pets At Home raised a staggering ₤7,037 for the Support Adoption For Pets annual 'Santa Paws' appeal. Since the fundraiser launched, on 23 November 2018, staff and customers in Pets At Home Southport raised enough money to provide nearly 14,000 dinners for the Greyhound Trust Lancashire. In the 4 weeks leading up to Christmas, customers shopping in Pets At Home Southport were given the opportunity to donate 50p to help provide a dinner for pets spending Christmas in a rescue centre, along with more than 440 Pets At Home stores across the UK. This time, the annual 'Santa Paws' fundraising appeal, which launched on Black Friday 2018 and ran until Christmas Eve 2018, aimed to raise enough money to provide 3 million dinners to homeless pets across the UK. Thanks to help from the people of Southport, the charity was able to exceed the record breaking total since the annual fundraiser launched in 2013. Support Adoption For Pets Fundraising Manager, Amy Wilson said:- "This year we set an ambitious target to help raise enough money to feed more homeless pets than ever before. When we found out that we had reached this goal we were amazed and grateful to everyone who joined us on our mission to help make this the most special Christmas for pets in rescue centres across the UK. We would like to thank everybody who made a donation in Southport. Your help has brought a wagging tail and a happy Christmas to the lives of pets who need it most." Support Adoption For Pets is a charity established by Pets at Home in 2006. Every year it helps more than 1,000 re-homing centres and pet rescue organisations across the UK through grant funding and support. In addition to its fundraising work, it also runs dedicated adoption centres in over 440 Pets at Home stores. To find out more about Support Adoption For Pets or to support the charity please visit:- SupportAdoptionForPets.Co.UK.